By MadJik, June 14, 2007 in Plugins - Publishing ONLY! This is a Render Texture Effect plugin. NB: Moved from Render (too crowded) to Texture submenu. Starting from the center (that you could offset) it will draw alternated triangles as rays. It uses the Primary and Secondary colors as default and could be multi-colors from the current palette of colors. Up to you to store your palettes and load your favorite before running this effect. The brush width is used to draw the empty triangles (uncheck “Fill the rays”). This plugin is added to the menu Effects, submenu Texture (was previously in Render). It works well in the range 4 to 200. Less than 4 give nothing or strange triangles. More than 500 gives strange figures and requires CPU... Even number is better for symmetry than odd number. 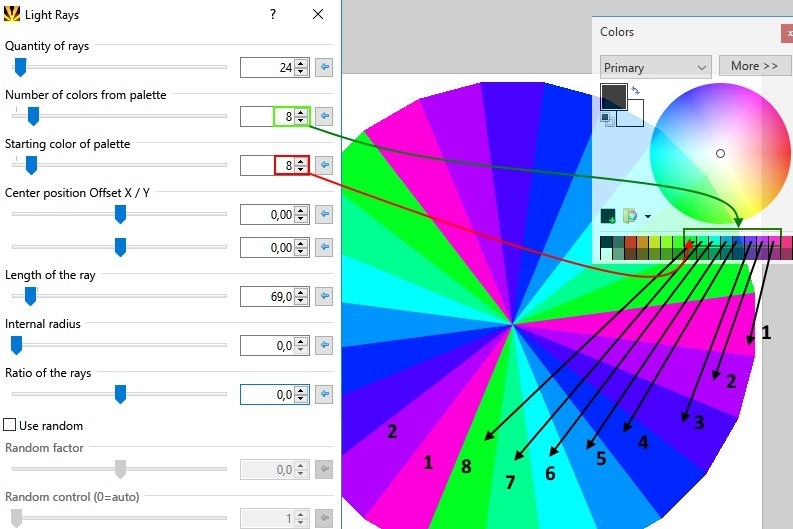 Also for symmetry with colors from palette try to use multiple of the quantity of colors. 1-96 to load the colors from the current palette. Each colors are repeated around the circle till it is filled. From the standard palette (black, dark grey, red, orange, yellow, etc.) you could choose to skip black and dark grey, set the value to 3 to start by red color. 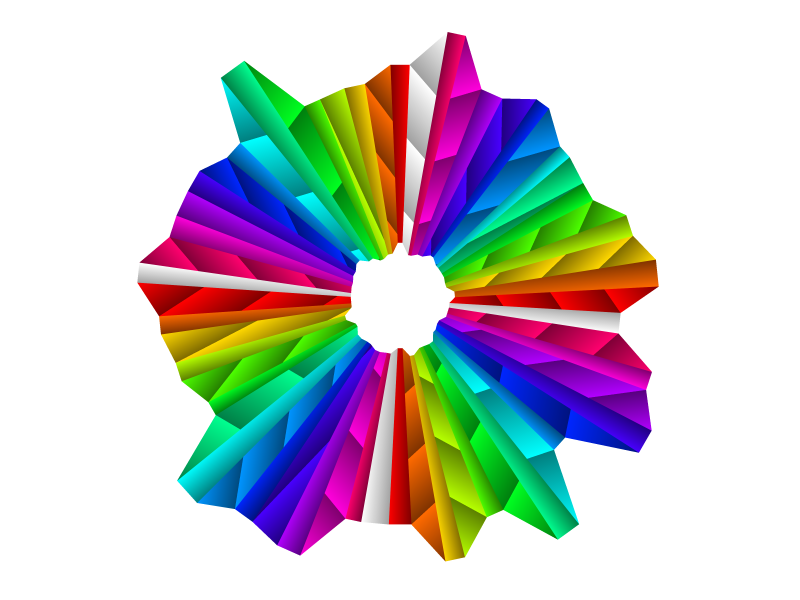 The color index is modulo 96 (number of colors in a palette). Negative value to move left/up, positive to move right/down. 100% is the width/height of the image, 0% is at the center, 50% is on the edge of the image. Allows you to reduce/increase the length of the ray. It's in %, not in pixel. Allows you to reduce/increase the center point/circle. You could obtain a ring instead a circle. 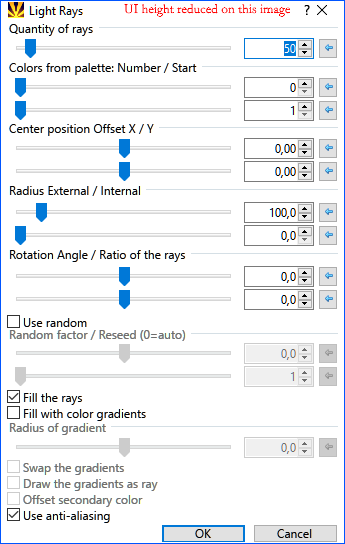 Allows you to choose different angle for the whole result. Allows you to change the ratio of the rays to have one thick one thin and so on. Check it to allow some chaos based on the random factor. This factor is here to set the strength of the randomness. 0 is no random effect. The impact is on the external/internal radius of each ray. If not 0 set the random generator to this fix value. It means the result won’t change while you are playing with the other setting. If set to 0, every change will produce different random result. Check/Uncheck to choose as you like, filled or empty triangles. The lines are drawn with the actual brush width. 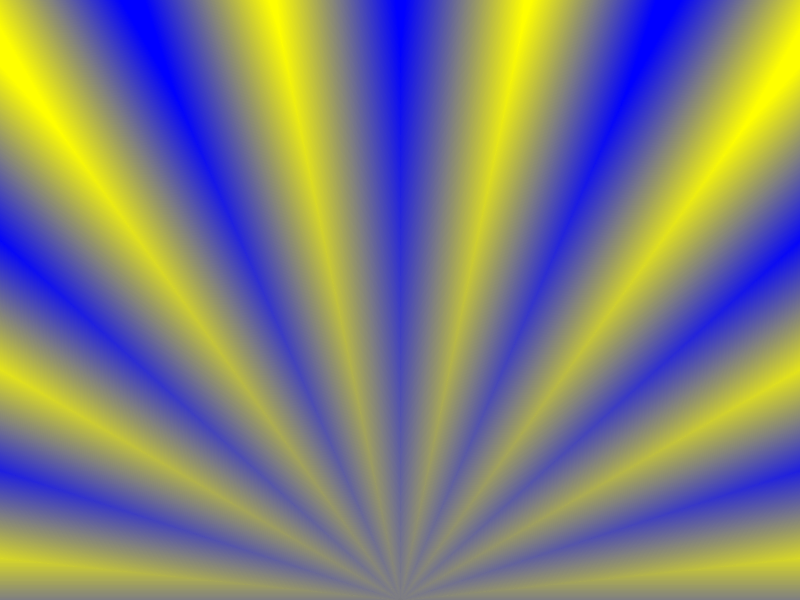 The rays are filled with a gradient from primary color to secondary color. With colors from the palette, the gradient use actual color and previous color from the palette. If Offset secondary color is checked then the gradient uses the actual color and the color below from the palette (on the standard black on the first row will be used with white on the row below). The gradient is based on the extreme limits of the triangle but here you could change the limits to make a repeatable gradient. Invert the direction for the gradients. As it says! Check the box you will understand. Hey, that is really cool. This can bee a lot of fun. Thanks for the plugin Madjik. Excellent Madjik! I used to do this by using Interlace at full strength and then a rect to polar! Don't worry about anti-aliasing...a quick zoom blur deluxe should clear that up. ^^Agreed on both the greatness of the plugin and using zoom-blur. To be honest I don't mind it not having AA because it give me a chance to try out other blurs which in turn created something very funky. Oooooh very nice MadJik! Yousa gonna be sharin' da source? Mesa curious! I'm thinking that aatwo is gonna like this one as well. Thanks for another cool plugin and agreed. Cool, this can be useful. 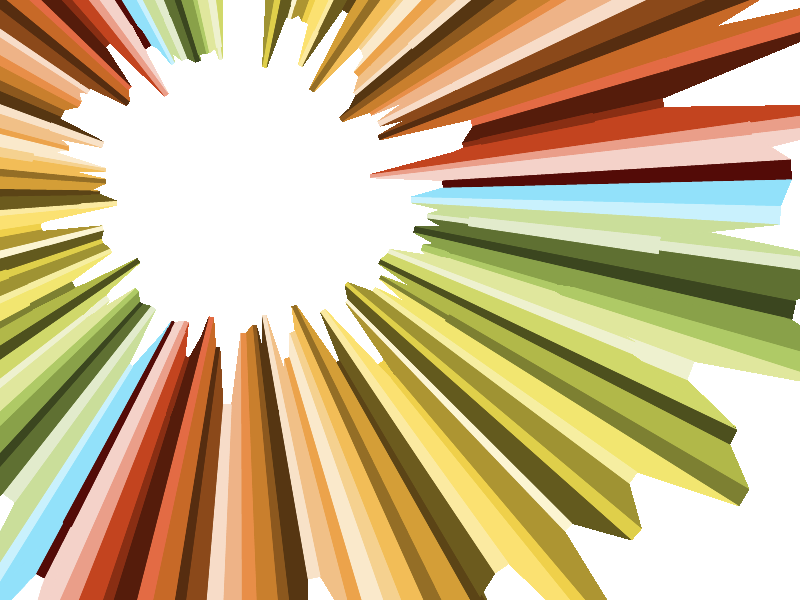 Could you use a transparent secondary color, then feather it? Yes but (...) Hey guys, lot of tuts to create! Let's go! In other news, I LOVE this plugin. MadJik is my new favorite person. EDIT: It's a plugin, not a tut. The good thing with % is there are infinite. If you make a 10000*10000 canvas, 50% still works, you're not limited to 600px. The error margin is greater then... 1% of 10000 is how many pixels? Just wanted to say I love this plugin; great for backgrounds; nice job. One small point, though, regarding the "Number of rays in the circle" slider (and this is not a criticism, just an observation). You cannot render an odd number of rays, yet your slider/arrows and the text entry box allow for selection/entry of odd numbers. Would there be any way you could get the slider/arrows to go up/down in increments of two? Maybe I am being a bit picky! Probably just jealousy as I'd love to be able to write plugins. @CJ: Not unless MadJik decides to convert this into a "normal" plugin, as CodeLab does not give you anywhere near enough control over the interface to do that. ...CodeLab does not give you anywhere near enough control over the interface to do that. You say that like it's my fault. Really? I actually like most people better when they're angry... Maybe it's the lovely shade of red their faces turn.